Writing my recent post about David Munrow brought back amusing memories of the Indian summer of analogue sound. When I was at EMI in the late 1970s a respected critic repeatedly criticised the sound balance of new classical releases that we knew were sonically top-notch. So an engineer was despatched from Abbey Road Studios to check out the critic's system. When he arrived at the hack's house he found two long speaker leads from the stereo amplifier. One loudspeaker was in the study, the other in the adjacent living room, so the journalist "could write reviews in either room". Critics were not the only culprits: a senior figure in EMI's classical division complained of distortion on white label pressings. When an engineer checked out the home system of the senior executive - who wielded a lot of power in the classical industry - he found a large lump of plasticine stuck to the tone arm headshell "to keep the needle in the groove". Then there was the Canadian journalist who asked Sir Adrian Boult to recount how Gustav Mahler invited him to conduct the first performance of the Planets. And later there was the British journalist whose 'authoritative' book on the classical music industry was pulped following the out of court settlement of a High Court action - the action alleged that the book contained more than fifteen errors, of which four were considered to be libellous. That journalist was subsequently awarded a prestigious music industry prize recognising "the commitment and work of artists and journalists who provided a real contribution to the ever increasing role of music in the culture of entire populations and individuals". (It is a conveniently overlooked anomaly that music journalists - who practice music criticism - are themselves subject to so little critical appraisal. If a professional musician performed in the same slipshod self-serving way as some music journalists, the musician would be laughed off the concert platform). And another expert commentator has been doing the rounds of swanky music industry conferences for years, after having been in the driving seat of the leading classical music magazine during the period its circulation - i.e. audience - crashed by more than 50%. But plus ça change. An independent label celebrated for its sound quality recently sent a new release into the market with prominent non-musical electrical transients in the SACD layer on the multi-format disc. At first the label pleaded that the noise was chairs creaking when the chorus sat down. When I asked if the chorus sat on electric chairs, the producer finally conceded that the intrusive sounds were due to computer instability in the SACD mastering process. As I write, the faulty discs remain in the market ten months after release. However I make no claim to being a music industry expert, nor do I claim infallibility. When I bought John Luther Adams' Become Ocean I returned the two disc set because one of the discs failed to load in my CD system: I had not realised the two discs contained the same music, one in CD format and one in DVD. Sibelius composed only a handful of works that have any chance of survival. Yet even that is a better average than many composers can show, and in years to come the chances are that the music of Sibelius will occupy a more prominent place than it currently does. At the time of his death he was suffering from a bad name and an aesthetic that ran counter to the age. If a new age does produce a resurgentromanticiam or neoromanticism, Sibelius could come back with it. He did, after all, talk with an individual voice when he was at his best, and he deserves to occupy an honorable place among the minor composers. The birds go to seek their mysterious king, the Simorg. Their journey is beset by terrible hardship, amid which some die, some desert, some turn back, some lose heart. When the survivors reach their goal, it is to learn the world’s most profound and vital truth. They are told that they have carried the Simorg with them all the time, and they realise that the treasures which we believe lies across cruel wastes, boundless oceans, towering mountains and dreadful valleys really lies within our own hearts. * Harold C. Schonberg quote appears on page 387 of my 1981 hardback fifth edition of The Lives of the Great Composers. 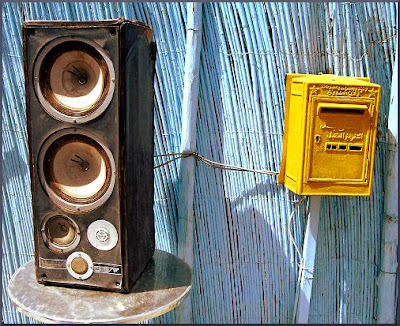 Photo of solitary loudspeaker (the other was in the study) was photographed by me at a caravanserai on the old road between Marrakech and Essaouira in Morocco. Any copyrighted material is included as "fair use" for critical analysis only, and will be removed at the request of copyright owner(s). Also on Facebook and Twitter. Thank you for the early Christmas gift. I thoroughly enjoyed this post and wholeheartedly AGREE with it! Wishing you the best holidays and joyous and healthy New Year! ^^ ^ what Qi said! One month later Alia Vox are still declining to take any action over the faulty SACD pressing of War & Peace mentioned in this post. Which reminds me of the following story. In 1949 Bruno Walter recorded Beethoven's Ninth Symphony for Columbia Records with the New York Philharmonic, and the recording was released on LP. But after repeated listening to the commercially released discs Bruno Walter concluded that the sound quality - particularly the balance between voices and orchestra - was unsatisfactory. So in 1953 Walter convinced Columbia to record the symphony again, offering the new version free to anyone who had bought the original set, on condition that the sub-standard discs were returned. I, and others, paid a not inconsiderable amount of money for War & Peace. In common with all other SACD players my Arcam CD37 defaults to the SACD layer; so I cannot avoid the intrusive transients. Which means I don't listen to that disc - Alia Vox has my money, but I don't have an acceptable disc. So the customer suffers. It can be argued that the defect does not make the disc unplayable. But as well as being unacceptably intrusive, it is causing inconvenience to customers. Take my own case: I bought the original set from Amazon and, because of the defect, suffered the inconvenience of having to repack and return it. Months later I bought a second set in FNAC in Marseille in the hope that the set had been repressed and my new purchase would come from a different batch. I then suffered the further inconvenience of having to carry the quite heavy set back to England on Ryanair as hand baggage, only to find the same fault. So I now have a faulty disc that I cannot return. Reviewers don't buy their discs so they don't have these experiences. Also, judging by the absence of comment about a very noticeable defect, reviewers don't listen very carefully. It is sad if Alia Vox - who have set the standard in SACD sound quality - does not feel that correction of the defect is justified. It is even sadder that, if this is the case, they do not acknowledge that discs they are still selling are sub-standard. Remaining stock should be over-stickered warning of the defect on the SACD layer, and the warning should be repeated on the relevant Alia Vox catalogue page. SACD may be a minority market. But SACD enabled listeners are the most sensitive to sound quality; which is why this defect should be publicly acknowledged if not rectified.